After visiting Portland a handful of times, I’ve always wanted to check out Seattle, too. It’s funny, the two cities have a weird rivalry, and our friends from PDX always told us we didn’t need to visit what they call “Shittle,” but I’m glad we finally made it up to the picturesque Washington city. It sure is pretty there—and the food scene is really great! While we ate SO MUCH food the whole trip, one particular restaurant was extremely special. 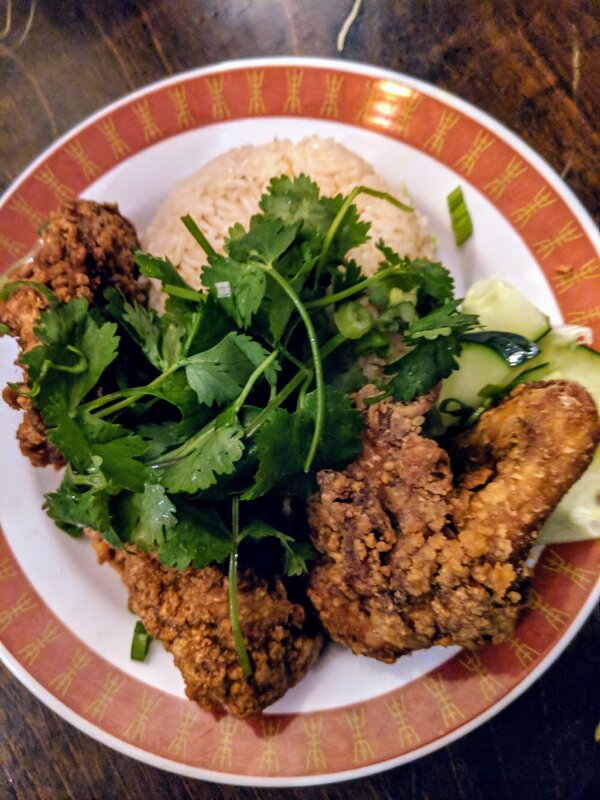 Kedai Makan is a Malaysian hotspot in Capitol Hill that practically EVERYONE recommended to me. We went on a Monday night, and it wasn’t as packed as people normally swear it is, so we put down our number and the hostess would text us when a table was ready. Since we popped down the block to dive bar Montana (a great visit!) and were enjoying ourselves, we simply asked to be bumped down the list and took the next available table instead. It was a relaxing way to wait for a table, for sure! Once we sat down in the restaurant, we ordered up some healing shots for the table and then got down to business. Basically, everything on the menu was recommended to one of us at some point, so ordering for the table was SO hard. Everything sounded so delicious. With our shots, we ordered the roasted peanuts (crispy anchovy, lime leaf, almost burnt chili), which were a fun way to start off the meal. Next was perhaps my FAVORITE dish of the whole night, though. 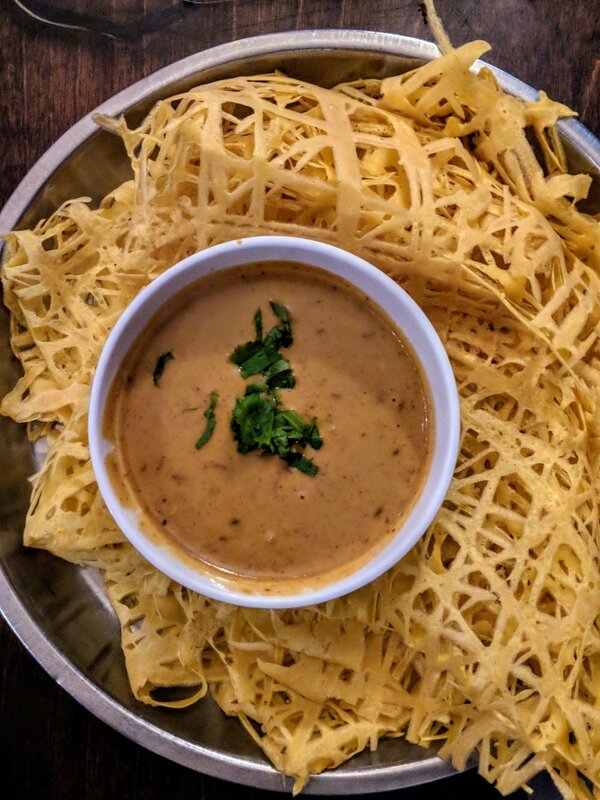 Roti Jala (malaysian bread with wheat flour, tumeric, and egg) is known as “net bread,” and it’s basically like lacy crepes—that’s as best as I can describe it. You gather up some of the bread in your chopsticks and then dip it into either dhal or lamb curry and try to not make a mess. We ordered both for our party of four, but the lamb was absolutely spectacular. I wanted to lick the bowl clean. 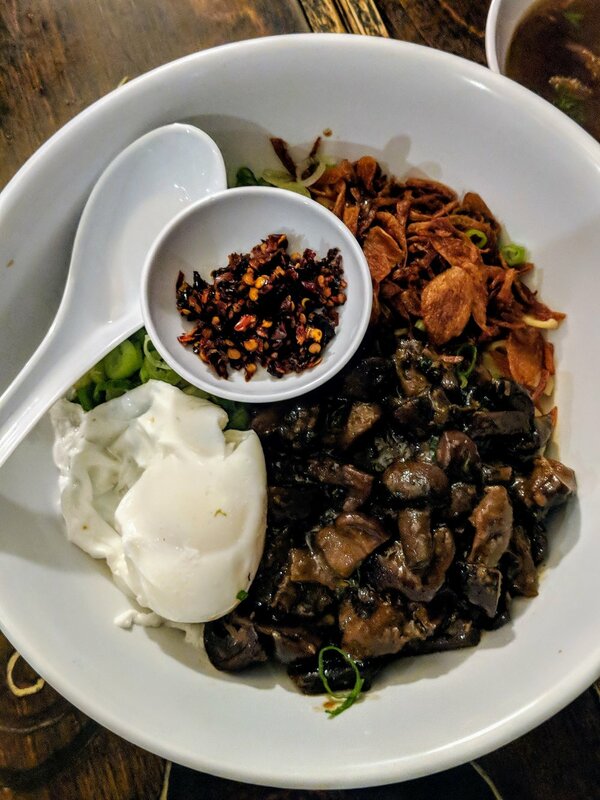 Next up was mushroom pan mee (homemade pan mee noodles, shiitake and crimini mushrooms, soy, green onion, poached egg, fried shallots, sesame oil, broth on side), which was so meaty and rich from the mushroom medley. Honestly, it’s hard to go wrong when it comes to runny egg and mushrooms. Our main course was super baller and blew everyone away. We all split the spicy black pepper ribs (pork ribs cooked with soy, caramelized sugar, black pepper, chilis, cilantro, sesame seeds, jasmine rice, cucumber) and spicy Malaysian fried chicken (with curry leaf, ginger, coconut gravy, sambal belacan [shrimp paste], jasmine rice, pineapple acar, cucumber), and they were both finger lickin’ good. But like, no, seriously. I tried to be delicate and eat everything off my chopsticks, but I quickly pivoted and devoured every slurp of sauces off my hands. They totally have dessert there, but we were all SO stuffed that we couldn’t even fathom eating another bite. So, the next time you’re in Seattle, definitely make Kedai Makan one of your (many, many) eating stops!